Cover-crop radishes have become a real hit with many Northeast growers to help improve their soil health. This article will cover some ideas on using radishes and some related crucifer cover crops to help growers fine-tune their practices so that they get more value out of this cover crop. and are mostly gone in the spring. While radishes tend to survive far into the winter south of Interstate 80 (roughly the lower 2/3 of the US), they typically die early north of Interstate 80 (the top 1/3). Growers in more northern regions may find that an alternative crucifer is the best way to get the radish benefits they’re looking for. Forage turnips, in particular, are more cold tolerant than radishes and survive more of the winter while offering the same benefits. For vegetable production, I like using turnips on raised beds that I want to plant early in the spring. The turnips are planted in the middle of August after a harvest of onions or beans. They grow vigorously through the fall, producing a lot of lush green leaves. Those leaves are full of organic nitrogen, and they stay green through much of the winter. Come spring, they decompose as soon as the temperatures warm up and worms go to work on the roots. The result is a bed that is essentially ready to plant. I can use a light cultivation to kill any new weed seedlings and to rake off the small amount of residue. Not needing to do any field prep in the springtime contributes a great deal to maintaining soil health. Rather than reduce soil health by vigorous tilling, growers can gain soil health, and save a lot of work, by simply leaving the cover crop to die naturally over the winter. 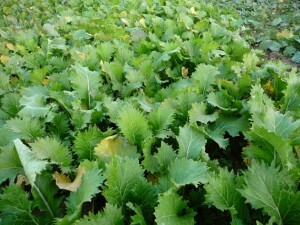 A turnip cover crop in the fall makes a solid cover with a lot of succulent high-protein leaves. leniency on timing. 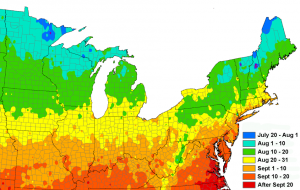 Regardless of how cold tolerant a given species is, the planting date is about the same. In central New York it is from the 10th to the 25th of August. Planting too early can result in the cover crop going to seed in the fall, while planting too late results in undersized plants that fail to suppress weeds, don’t produce the desired biomass, and don’t make the deep roots that alleviate compaction and recover nitrogen. One helpful aspect for the small farmer is that this cover crop seed is relatively inexpensive to use and can be stored for several growing seasons. The seed cost is generally $3 to 5 a pound, and seeding rates are less than 10 pounds per acre. Indeed, the plants tend to inhibit each other so planting more heavily than recommended can actually cause a substantially weaker stand. Soil First Winter kills early in winter. Makes two-inch-wide holes in surface soil, but the thinner taproot does a lot of the work. Similar to oilseed radish, but the thick part of the root goes deeper. The top of the radish can stick out of the soil several inches, making the field difficult to walk through. Some growers are using rows of radish in a grain cover crop to simulate zone tillage. Idagold (High glucosinolate) Bolts quickly any time. Excellent for chickweed suppression. Bolted plants hold snow in place. Tilney mustard can also be frost seeded in February or March. Pasja (Slow bolting, more leaf) Makes a strong rosette and bolts later than rapeseed. 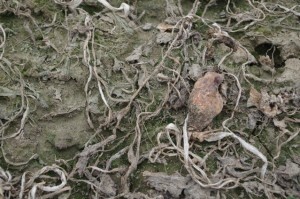 Rosette provides good soil cover for minimal winter growth. Can survive until after snow melts, thereby releasing nitrogen that will be available to the following crop. These high-protein varieties have more nitrogen to release than others. Sumner (hardiest) Survive winter. Slow growing in fall, so the weed suppression is weaker. Bolts in spring. Can frost heave if sown late. By spring there are only vestiges of the turnips left in the ground is easily prepared for planting. Radishes in December look alive but are doomed. Even though there many green leaves, the above ground part of the radish is already pithy and dry, and the below ground part fully waterlogged. early in the season. But be aware that even the tenderest varieties can have some survivors in the field after mild winters. Unexpected survivors need to be killed before they make seed so that they don’t become weeds. The flowering time varies by species, but is often in late April or May. The plants most likely to survive are those that are large enough to have strong anchor roots but are small enough that they do not start to swell (turnips and radishes) or bolt (mustard and rapeseed). They are excellent for disease suppression, winter weed suppression, and tilth improvement. They help soil re-aggregate if roots are allowed to decompose in undisturbed soil. Their deep taproots can recover residual nitrogen. This nitrogen is available to next crop if the cover crop dies in the spring. All are inexpensive to use because the seed price is low ($1 to $4 per lb) as is the seeding rate (5 to 10 lb/ac). Small seeds, which require careful sowing, mean less bulk to plant. Most work best if sown in late August and left all winter. The window closes fast. Most respond well to nitrogen, just like other cole crops. Detailed information on how to manage each of these, and where to buy seed, is at the Cornell website, covercrop.net.